Whether network access takes place via 3G, LAN or Wi-Fi, Perimeter 81 offers government organizations and educational institutions an easy-to-use and secure solution for even the most sensitive private networks. Government and education organizations - at the state, local and federal level - require secure data communication solutions that are equipped to handle today’s growing cyber threats. Government and education departments must ensure that on-site employees, telecommuters, sub-contractors and remote workers and offices are all able to effectively access and share critical information securely. With various end devices, operating systems and connection protocols, it’s getting more and more complicated to secure increasing endpoints into the network. Additionally, cloud environments, applications and BYOD devices further complicate network security. Cloud environments and platform resources such as Google Classroom and Microsoft Office 365 have transformed learning environments and government departments into modern, cloud-based tools that require secure remote access. Perimeter 81 offers a secure network access solution that can be easily implemented and used by employees with the click of a button. Users traveling or accessing data outside the office have uninterrupted, secure connections that can be easily managed using the management platform. Our cost-effective solution enables VPN server and client deployment easily and instantly - without the hassle of manual configuration or help desk support. All transmitted information is encrypted and protected against malicious penetration of the network - supported by around the clock intrusion monitoring. Our hardware-free Cloud VPN eliminates the need for costly external hardware and tedious installation, allowing users to access the network with a single click. Gain control over the network by managing and monitoring from one central location. Users can connect, share and respond quicker and more securely. Track and audit all transactions ensuring complete data recovery and protection against data loss from hardware or software failures. It’s important that government and education entities are able to define varying levels of access to the network according to appropriate clearance statuses. Government and education organizations are liable for security breaches. In fact, individual positions such as principals can even be personally sued. With Perimeter 81, you can instantly access and audit activity on the network. By defining user access roles, you can secure sensitive data and partition only necessary data to those who need it. While COPPA and FERPA may be familiar, other compliance regulations such as HIPAA are also relevant for any government or education organization that records, maintains or shares health information on students or employees. According to compliance, any organization must provide reasonable security and at the very least, encryption, for all private health data. It's well known that many products and services have shifted to the cloud, and while this increased accessibility is beneficial for government and education operations, it also means that any momentary network breach could restrict access to these cloud-based services and cause delays that could last multiple days or longer. Government and education organizations must meet strict security policies and compliance obligations in an attempt to keep private data protected. Perimeter 81 secures all data in the cloud and on-site using 256-bit AES private encryption keys. Any third party, including the cloud provider, is unable to decipher any data transferred to and from the network. Our Automatic Wi-Fi Security feature immediately shields data by automatically activating VPN protection and encrypting data transmitted over Wi-Fi networks, even if an employee’s device is in locked mode. 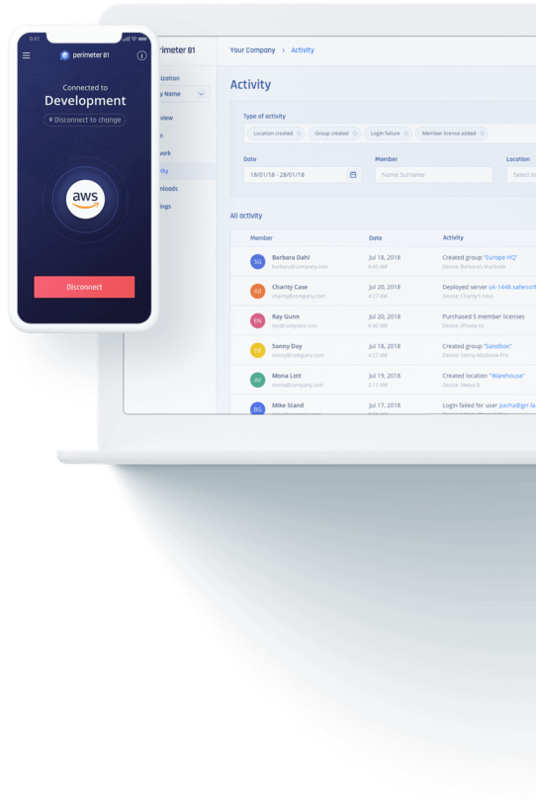 With built-in Single Sign-On (SSO) integration and Two-Factor Authentication (2FA), Perimeter 81 enables easy user access management and policy control while adding an extra layer of network security. We’ve chosen to complement our security solution with additional compliance standards so that we can deliver honest privacy and security to our client’s on-premises, hybrid and cloud environments. With Perimeter 81, government and education entities can validate user devices, secure unlimited endpoints and easily protect the integrity of data transmission both on-site and remotely.